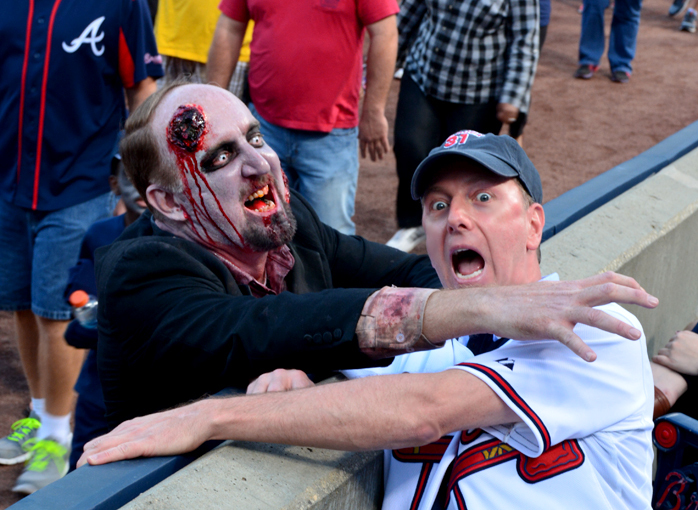 The fantastic Atlanta Braves hosted Zombie Night last evening at Turner Field. They host a number of Theme Nights throughout the year, but this one I definitely wanted to experience! Zombies are fun, but I also love baseball, so this experience was a home run! These lovely young zombies were at the entrance to greet fellow zombies and baseball fans alike. Who knew the two fandoms would meld so brilliantly! MLB published a brief video about the evening: Zombie Night. 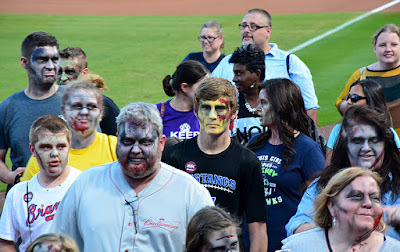 Those who purchased a special Zombie Night ticket had special seating, were invited to the talents of zombie makeup artists, participated in the pre-game on-field Zombie Parade, and were gifted a Zombie Survival Kit! I almost fell prey to the undead! But I'm a fan of The Walking Dead and have learned a thing or two about Zombie Apocalypse survival. Thank you, Rick, Daryl and Michonne! The theme music to The Walking Dead was playing on the loud speakers during the Parade, so that helped me tune in to those television-learned zombie attack survival skills. 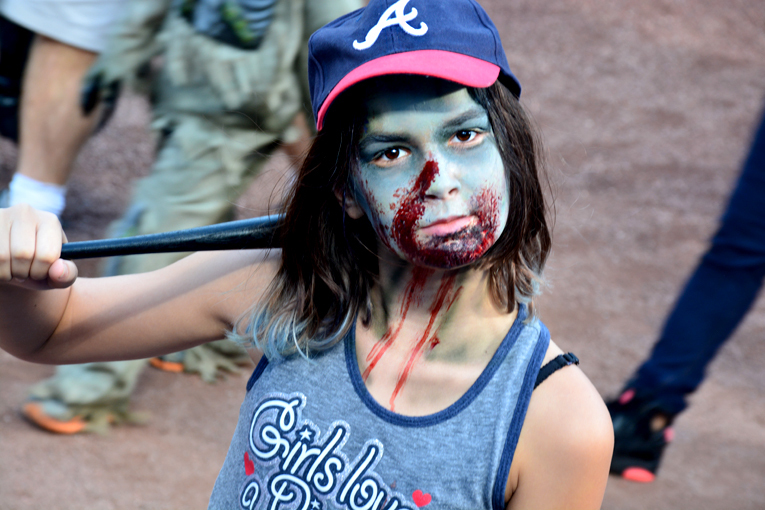 Speaking of The Walking Dead, Atlanta Movie Tours was part of the pre-game festivities! In case you didn't know, they offer two Big Zombie tours (Big Zombie Tour 1 & Big Zombie Tour 2), and both are fascinating! THIS young lady was totally into Zombie Night. She has a promising career in theater, cinema or perhaps modeling...whatever she decides, I think she's going to be brilliant! I applaud parents to take their kids out to experience so much of what life (and Atlanta) has to offer. Always make childhood fun...they only have one! Turner Field offers a number of Theme Nights throughout the season. In addition to Zombie Night, there's Military Appreciation Night, Star Wars Night and Bark in the Park, to name only a few. 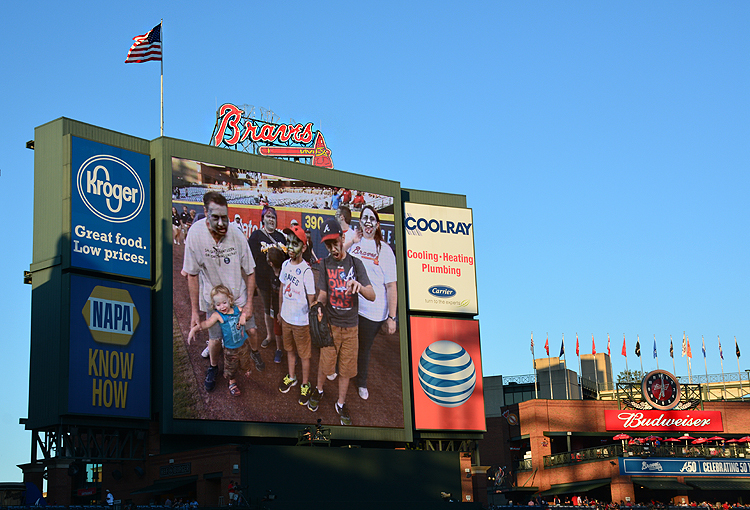 Throughout the evening we were treated to zombies and zombie families (see the one above) on the Jumbotron. Even some of the Turner Field staff were sporting zombie makeup. 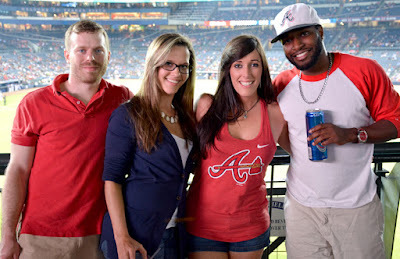 Speaking of Turner Field staff, I was delighted at how pleasant everyone was. 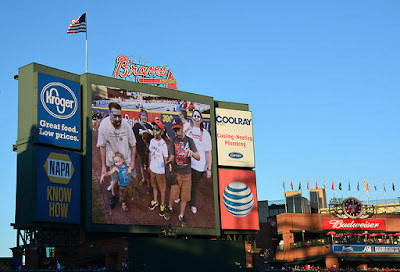 Thank you Turner Field staff for helping to make it such a fun night! When I noticed that the competition had been "zombiefied" on the Jumbotron, I thought how brilliant and what fun! 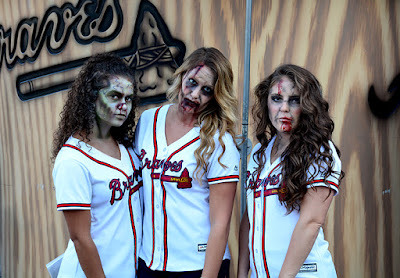 Then I realized that they "zombiefied" ALL the players, Braves included. Total fun! Oh! And there was a baseball game going on, too! 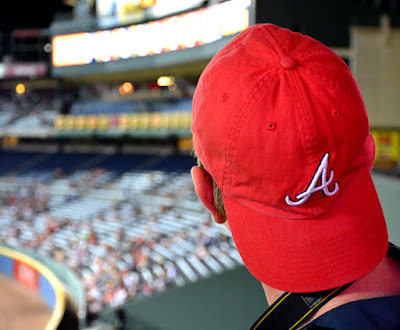 Actually, I've been an Atlanta Braves fan since I attended my first Braves game in 1990, the year before they started winning pennant after pennant—and a World Series—throughout that decade. The players have changed since then, but they're still my Braves AND they won the game on this evening...2:1 against the Phillies. 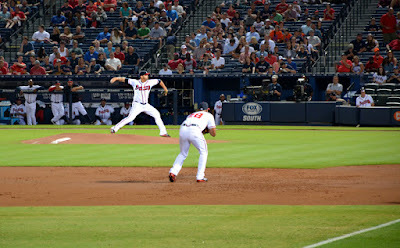 Go Braves! I always enjoy meeting new people and these ladies and gentlemen were awesome! The two on the left told me that they're engaged! A heartfelt wanderlust ATLANTA "Congratulations and a long and happy life together" to you both! 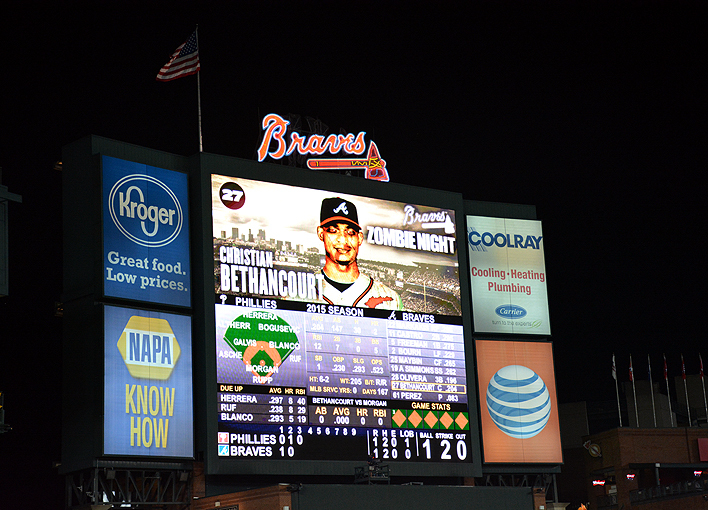 We met in the Braves Chop House, which I'm not entirely certain I've ever visited. I've had seats at every point in Turner Field, from behind home plate to the nosebleeds! And I've enjoyed every single vista! Embarrassingly, the last time I had seats behind home plate, one of the ladies seated next to me was texting her mother who was watching the game on television and saw her on TV...and me devouring a hot dog! I sincerely hope that wasn't part of my 15 minutes of fame! There's a LOT going on throughout Turner Field during an Atlanta Braves game. One surprise last night was that the gift shops were having a 70% off sale (on the greatest majority of their inventory). Also, there are the batting cages; LOTS of dining options; the Braves Chop House; the Atlanta Braves Hall of Fame & Museum; lots of photo ops, the Coca-Cola Sky Field...the list goes on and on and on...there's LOTS to see and do here! And, did you know that you can tour Turner Field? I've done this tour and it's fantastic! 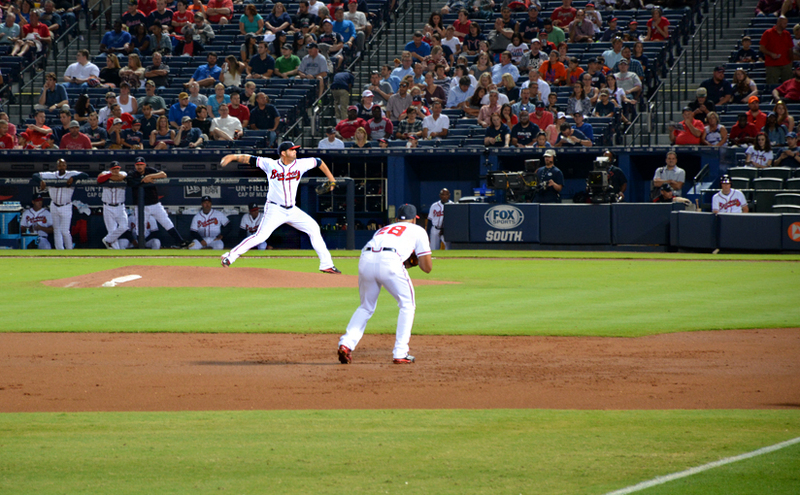 It starts in the Braves Museum & Hall of Fame. I definitely and wholeheartedly recommend this tour. And if you didn't know, Turner Field was our 1996 Olympic Stadium re-purposed for the Atlanta Braves. That geographic area is in transition as the Braves are moving to Cobb County...I just hope that we/Atlanta gets to keep this historic landmark! 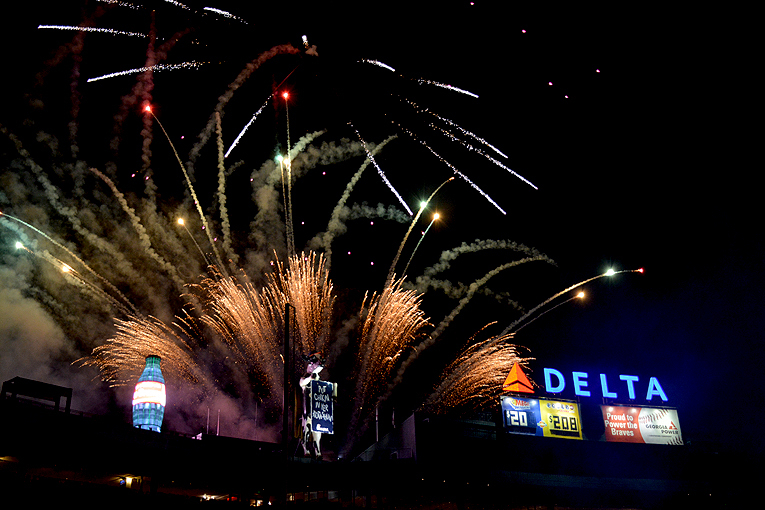 Friday evenings are Fireworks Night at Turner Field and it's a magnificent show! One of the best in the Southeast, for sure. There are a number of Atlanta Braves games at Turner Field now through October 4, 2015, and there are a few more Theme Nights. So, make your way over and enjoy all the fun that this wonderful venue has to offer!